Leads are one of the most important things for businesses to get, especially if you are trying to be profitable by running some sort of home based business online. One method of getting leads is to network with other businesses, but sometimes it can be hard to find ways to contact them. 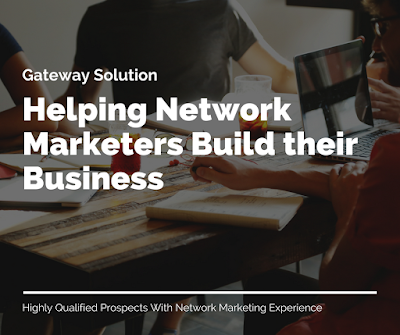 MLM Gateway is a free method of doing just that, as it connects members to each other and helps them to find business leads for their home businesses. MLM Gateway helps business owners find each other and get connected to see if they can collaborate with each other. Its members are all part of a network of all kinds of business owners who are doing online marketing, and who are looking for others to form partnerships with. Once signed up, members can socialize and build teams as part of a multi-level marketing network. It is a system for both new and experienced business owners who want to get more leads to their business programs. After a business owner has registered and signed up for the MLM Gateway services, they are ready to go for accessing other members and looking for potential partnerships. Requests can be sent to prospective partners for information or the business owner could get requests from other members as well. It’s a great way to learn how to network and meet other business people online. There is an easy to use form to fill out in order to contact other members. The form doesn’t give out the member’s personal information such as their email or phone numbers, and the business owners can decide on their own if they want to continue speaking to the other members on a case by case basis. This ensures each user’s privacy. However, if you decide not to answer another member’s request, then you are banned from contacting that particular person for a year. If a member chooses to use MLM Gateway to advertise their product or services, this can also help them to get traffic to their business website. If they refer a new member or write a business announcement, the members can earn free advertising campaigns on the website, or they can use their credits to purchase them. Since the site is visited by thousands of people and has thousands of other business members, advertising your business there can be a great help to growing your company and getting leads. MLM Gateway is free to join, and offers several methods of connecting with other members who work all over the world and in all different niches and venues. This makes it a good choice for anyone who doesn’t have a lot of experience in online sales and marketing, and who are anxious to learn quickly and grow their business to earn money. However, it can also help experienced business owners, as they can mentor the others, as well as get new leads for their own websites. Members can also use advertising on the platform to help promote their businesses, such as publishing announcements and running banner campaigns. All this is free to sign up, but there is also an option for a premium membership that allows users to have much more benefits by letting them buy or earn special credits, which will then be used to buy various activities. Premium members pay a monthly fee, which at the time of this article was $25 a month, but could be subject to change. The MLM Gateway credit system is used to do things like contact other members, run ads, etc. Many members report that the services they get by joining the premium version help them to make more contacts and profits that can in turn help pay for the monthly fees or fees for buying credits. If you choose to buy credits, the sales of these are final and no refunds are given by MLM Gateway. You can also earn these credits without a premium membership by doing things like signing up for membership, getting someone else to sign up for membership, posting your business on MLM Gateway, or by sharing MLM Gateway to your Twitter or Facebook social media accounts. It’s up to the members whether or not they desire to go the free route with MLM Gateway or sign up for the premium services. Either way, there are lots of ways to use MLM Gateway to grow your business and make more money selling your products and services. If a member has any problems or questions, they can get in touch with an MLM Gateway customer service person via the Support link on the website or by calling them at +420 732 304 537. As you can see, it is located overseas, so be prepared to pay the associated phone rates. They are in the Czech Republic, so also the time zone is different, depending on where the members live, and have members all over the world. All in all, the MLM Gateway system offers a good opportunity for business owners, especially those who are new to online marketing and selling products and services from their home-based companies. It brings together like-minded people who can collaborate and learn things from each other and build their network to help their businesses grow and thrive, as well as offering ways to promote your business via advertising, etc. So, if you are a business owner looking to get more leads to your business website or who wants to find a better way of advertising your products and services as you meet other business owners, then the MLM Gateway program and its services could be the best thing for you to join and try. By clicking the sign up link on this page you get 5 free credit to begin with, so take a look at their website at and start sending messages to other members today! 0 Response to "HOW TO GET LEADS FOR YOUR BUSINESS - GATEWAY CASE"